Most people go to the Exuma islands for the translucent aquamarine waters and the powder-white sand beachfronts. 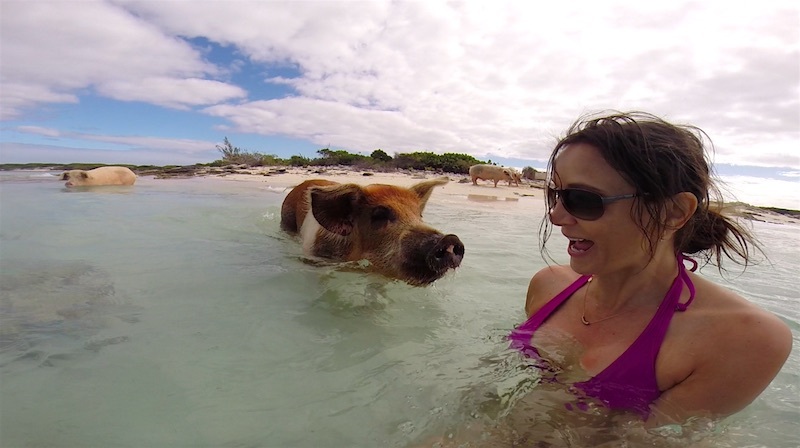 But, now this part of the Bahamas has a new hot spot — Pig Beach. 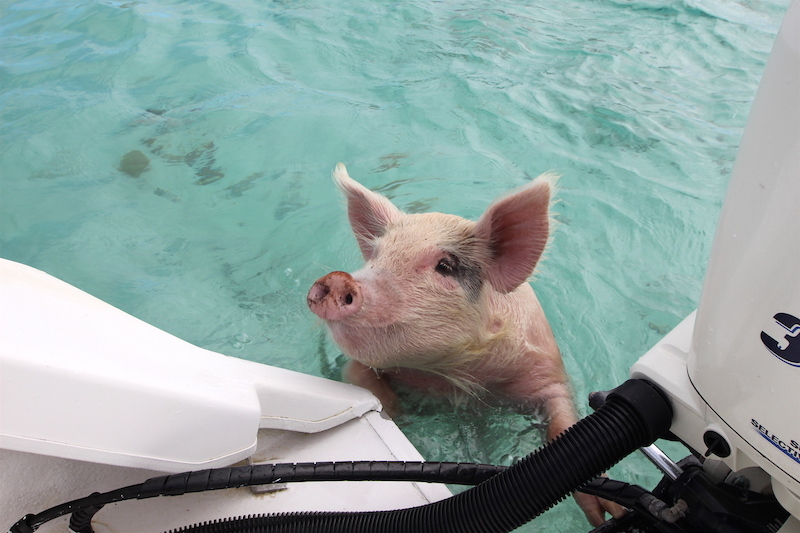 You can take a boat excursion to the piggy island and hang out with the swimming pigs (no joke!). 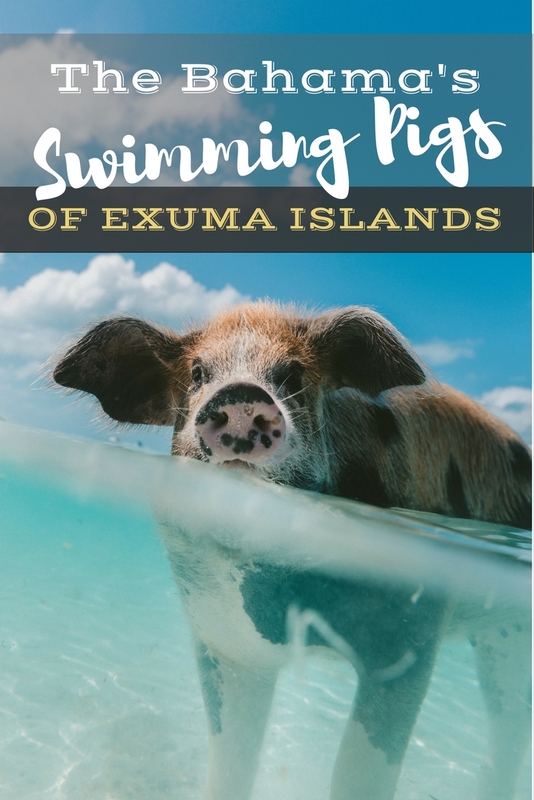 It’s a fun tour that will have you feeding chicken hotdogs to the famous Exuma Bahama’s pigs, seeing some iguanas and maybe even cuddling a piglet. The Exuma Islands are known for their translucent aquamarine waters. Bordering the endless shades of blue were the powder-white sand beachfronts of the crescent-shaped shallow islands. There are 365 of these cays along this section of the Bahamas, covering 130 brilliantly turquoise miles. Some are privately owned by famous stars like John Depp who fell in love with this area of the Bahamas while filming Pirates of the Caribbean and illusionist David Copperfield who was so enamored he purchased Musha Cay, a 150-acre piece of paradise that has been transformed into a luxury resort costing just under $40,000 per night. It wasn’t hard to see the attraction of the Exuma Islands. It was a laid back archipelago where the time seemed to move slower. Much different than our starting island of Nassau, where the cruise ships dock and Senor Frogs is packed to the rim with tipsy twenty-somethings toting around two-foot tall cocktails. A quick half hour flight from the busy duty free shops, tour buses dropping off dozens of people in front of the Atlantis casino and blaring music from the second floor of the downtown bars, is a pint sized version of it’s capital counterpart. In Exuma name-brand bars are traded in for the clear turquoise waters that surround stretching sand bars and beachfront grills where visitors sip on a chilled bottle of Kalik, the official beer of the Bahamas. 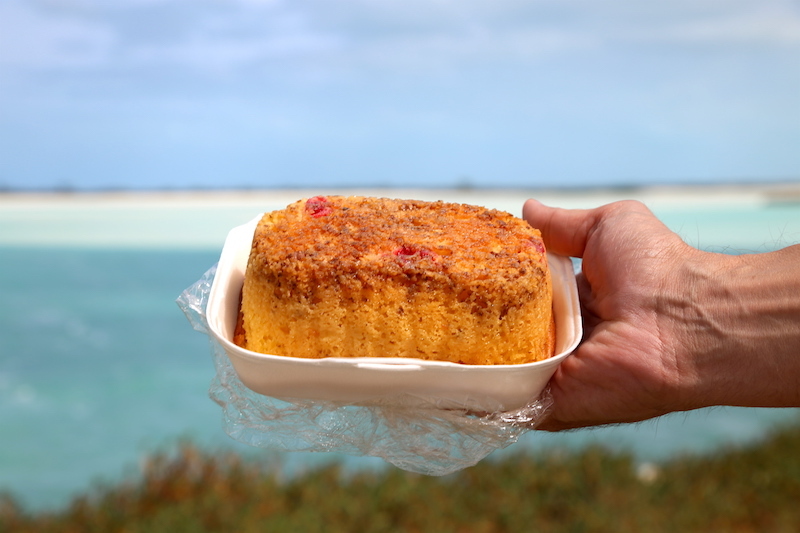 If you drive far to the south into Little Exuma you may find yourself at Santana’s where people fill the handful of seats at the bar for a plate of their specialty, the cracked spiny lobster. 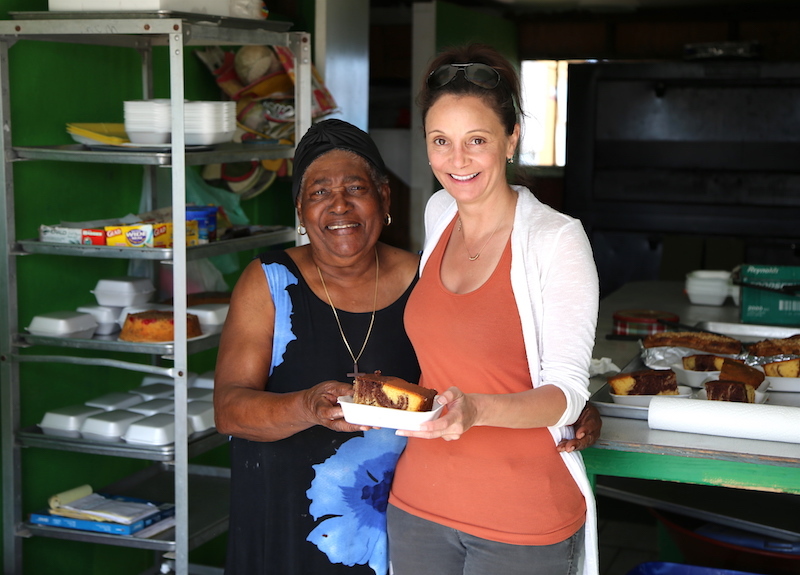 Right next door in a teeny building you can get dessert at Mom’s Bakery, mama herself will sell you a loaf of her to-die-for rum cake that crumbles to the touch and melts in your mouth. Rum cake so scrumptious you won’t want to share. 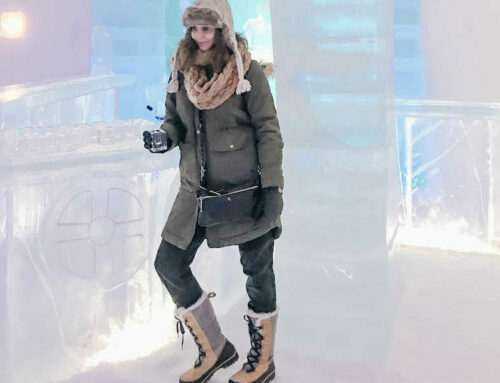 It is so delicious and she is so charming, that you will want to make that half hour trip from the main city of George Town again and again. 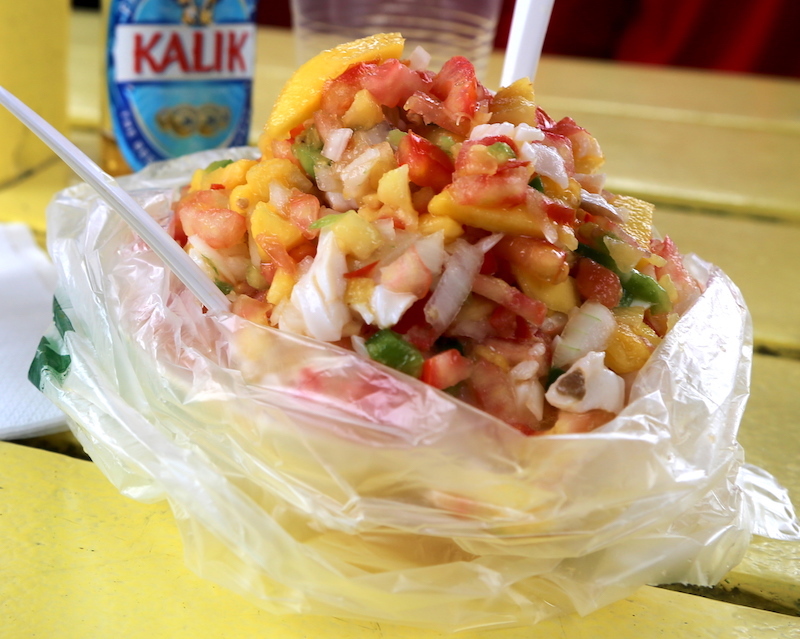 Far to the north, a stop at Bid D’s Conch Spot will get you a bowl of the conch salad, a Bahamian tradition that you can’t possible leave the islands without trying. In Rolle Town, stop at the Haulover Bay Bar & Grill for a Bahama Mama cocktail and one of the best views in the world. The shallow waters mixed in with sand bars and blue upon blue upon blue. We sat here, alone for hours watching the kite surfers glide over the shallow waters. This may be the best kept secret in Exuma. If you are missing the party atmosphere of Nassau, you could take a five-minute ferry ride from the big island to the nearby Stocking island for the Sunday afternoon pig roast at Chat ‘N’ Chill. Here boats line the waterfront, and there’s always a large group of people indulging in Goombay Smash cocktails, playing sand volleyball or sunbathing on the beach. As if all that wasn’t enough. There are swimming pigs. That’s right, you heard me correctly. 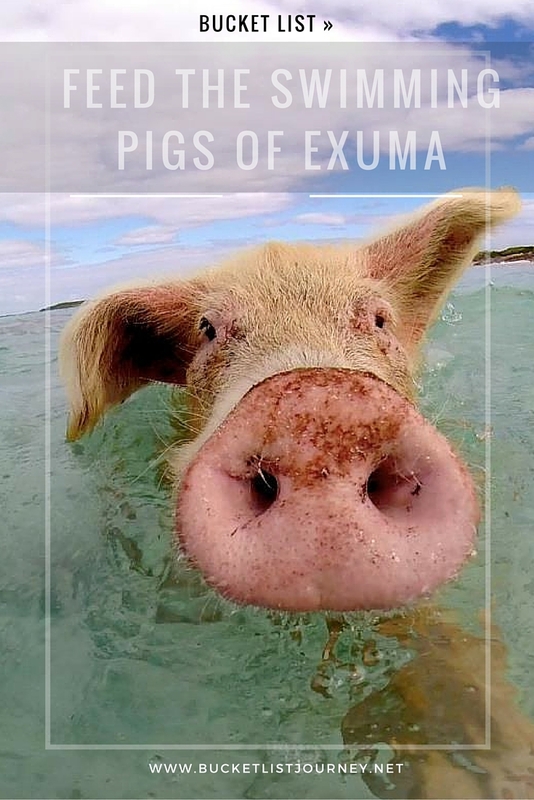 You can go to Exuma to feed swimming pigs, something that the isles are now known for. Even the show the Bachelor visited with his bachelorettes. These piggy residents is why I had come, another check off my bucket list. The are two island locations to accomplish this goal, one at Big Major Cay and the other on White Bay. Major Cay, also known as Pig Beach, is the original where it is rumored that the pigs were put on this vacant cay by their owner years ago because they were stinking the area up near his home. Eventually the pigs knew he was coming to feed and they’d greet his boat in the water in order to be fed first. Major Cay is 65 miles from the north end of Great Exuma, about a two hour boat ride. 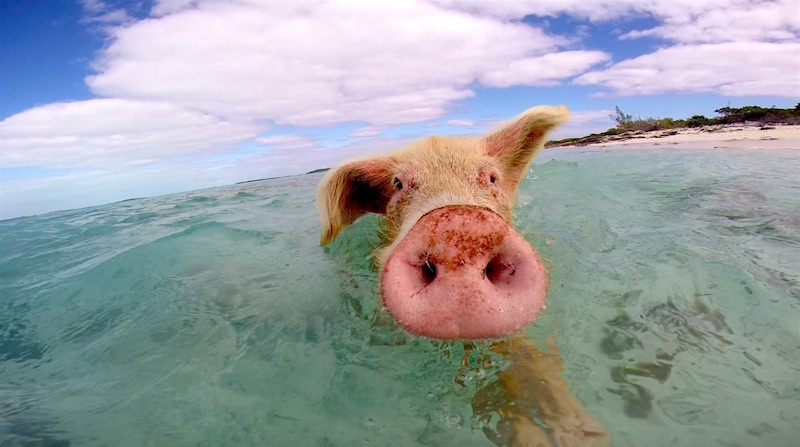 The competing porkers on White Bay Cay are located just a ten minute short boat ride from the mainland. The difference between the two depends on whom you talk to. The Major Cay supporters say that it is the original and you shouldn’t accept imitation pork, where as The White Bay Cay supporters claim that the original pigs have gotten lazy due to an influx of tourists and now wait on the shore waiting for tourists to come to them. Either one you choose you will see swimming pigs. Our boat trip with Exuma Water Sports was a half-day tour that included a piggy stop at the nearby White Bay, a choice made due to the choppy waters that day and my husbands affliction of seasickness. It was his birthday, seasickness would be a terrible celebration. This was guaranteed to be a smoother ride where the rocking of the boat would be limited. We started the tour by flying by Pudding Cay and making a stop right where the Caribbean and the Atlantic meet. The water was swooshing around in a battle of which way to go and so clear you could see down 59 feet. 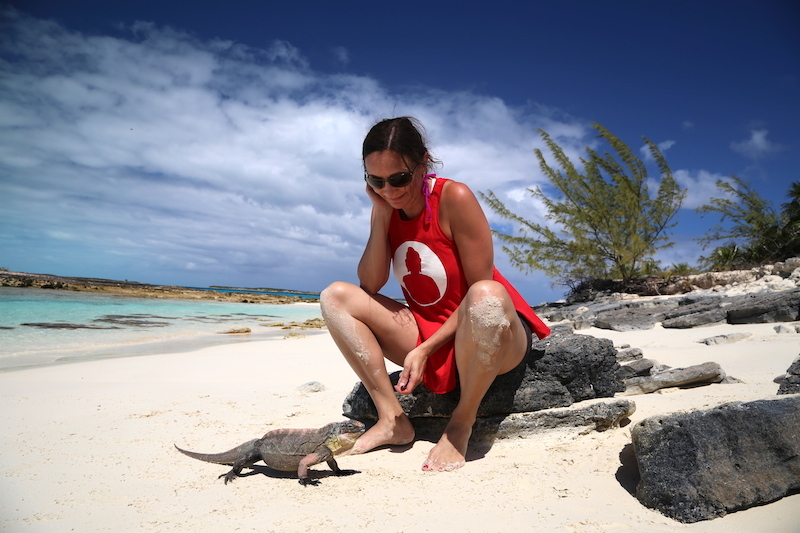 After there were a couple of Bahamas cay stops, a chance to see the view on a mountain from way above, get caught in a powerful blowhole and…see the reptiles on Iguana Island. 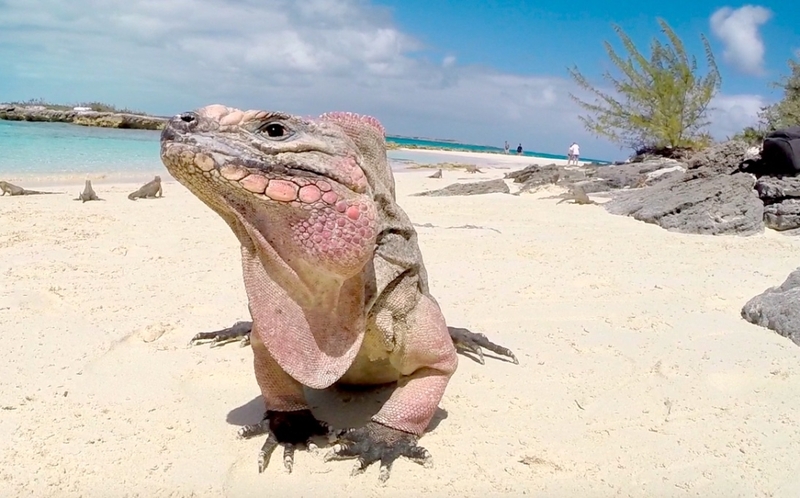 When we approached Iguana island, one lone one stood at the beach. In a matter of seconds others came from the brush. 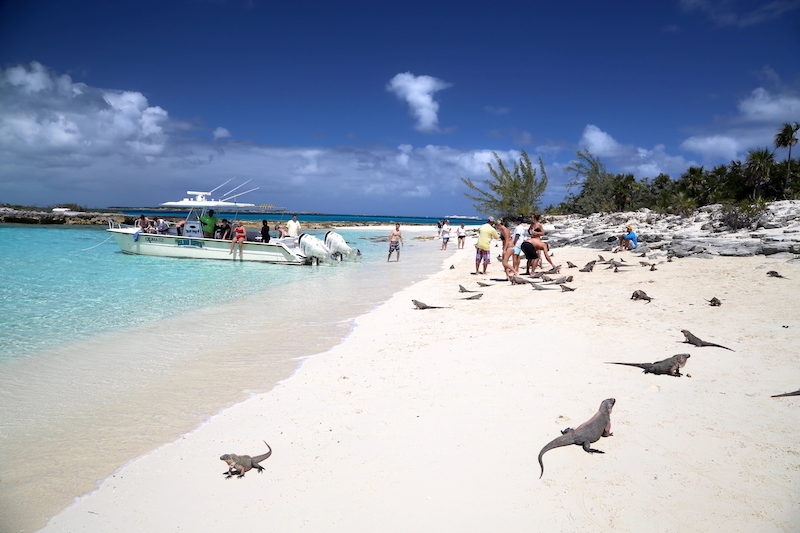 Soon the cay came alive with iguanas waiting for the boat to dock, unlike the pigs, they don’t swim. It was a greeting quite like no other. Armed with a handful of purple grapes, I popped one to the ground and a group of these animals swarmed me. When my grapes were done, I sat on a rock and one little guy came towards me mistaking my painted toenails for a tiny round grape. He licked it a couple times until he realized it didn’t taste good. As we pulled up to White Bay Cay, it looked more desolate than the iguanas. The boat stopped a few meters away from shore and we quietly waited. Nothing. The captain of the boat gave a little jingle of the bell and then the bushes came alive. 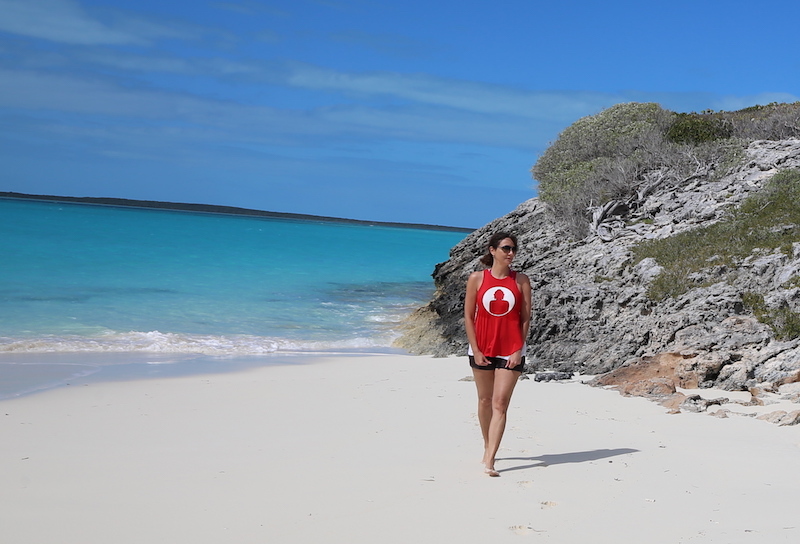 Everything on Exuma is relaxed, moving at a snails pace, no one was in a hurry. Until the ring of the bell. A dozen pigs and piglets came running out of the low shrubs, some stopping at the shoreline and others making their way into the water knowing that they will be fed first. The captain said, “if you want to feed the pigs go ahead and jump in”. I hesitated for a moment taking in the oddity that lay before me — pigs were swimming. I squealed like one of them, this was going to happen. I jumped off the side of the boat and two nostrils came straight for me; a round nose perched slightly above the translucent blue water level. His feet were moving underwater way faster than mine. We were nose to nose, playing a weird game of chicken, which I regretfully lost. He barreled into me and after realizing I had no food, turned the other direction moving on. Next time I was better prepared, holding a few chicken hot dogs in one hand and my GoPro in the other. Of course the next porker went straight for the camera. Finally, there was success. Moving to the shore, big troughs would be filled with cabbage, rice and fruits, plus fresh water. These pigs ate well. Piglets were hiding in the brush, making an appearance every now and again. The gave out a little squeal if you pick them up. But, holding them close to my chest and petting their heads soothed them until they almost fall asleep. The perfect end to a memorable day. No trip to the Bahama islands of Exuma would be complete without taking a boat ride to pig beach to see the swimming pigs and cute piglets. 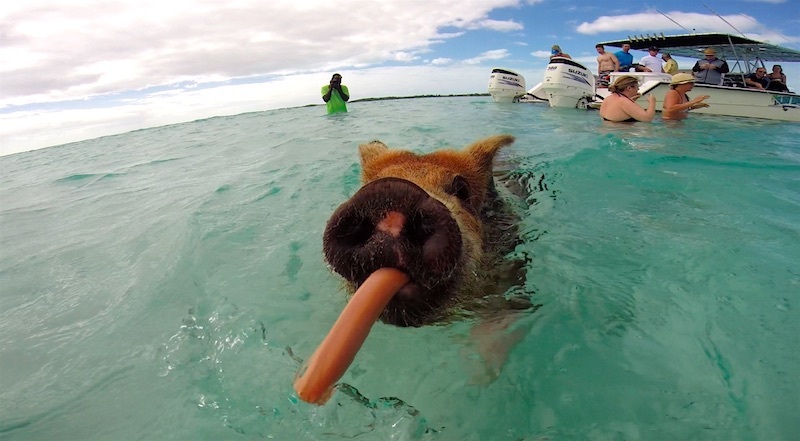 If pigs can now swim, this may make me rethink ever using the term “when pigs fly”. You just never know. The Bahamian Island of Exuma lies 35 miles southeast of Nassau and is divided into three major sections; Great Exuma, Little Exuma and the Exuma Cays. There are over 350 cays, small low islands, many of which are privately owned. The swimming pigs can be found on two of these cays, the original being the Big Major Cay (sometimes called pig beach) and the other at White Bay. The most popular way to reach Exuma is either by plane or ferry from Nassau. 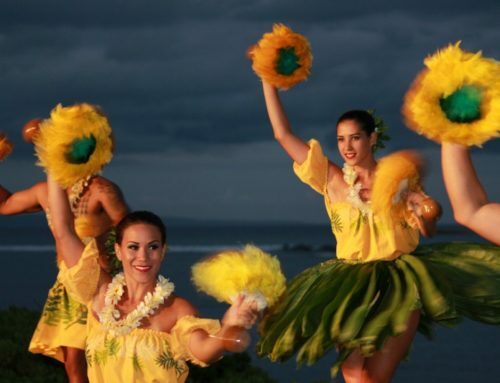 Daily service via Bahamasair or Sky Bahamas from Nassau, which is a quick half hour flight. You can also take the night ferry through Bahama Ferries which will take considerably longer, about over 10 hours. The currency is the Bahamian dollar, though US dollars are used just as frequently and the exchange rate is of equal value. There’s no need to change any money, though you may sometimes get your change in Bahamian coins. Many restaurants and gas stations are cash only, so make sure you bring enough, or there are also ATMs available. The electrical outlets in the Bahamas are the same as the United States, so there is no need for an adapter. At most restaurants your bill will include a 15% service change. Typically there is another line on the receipt that says “Extra tip” in case you would like to add more, though it is not expected. Most other services (taxis, spas, tour guides, etc) that do not include a service charge on their bill, a 10% tips is acceptable. 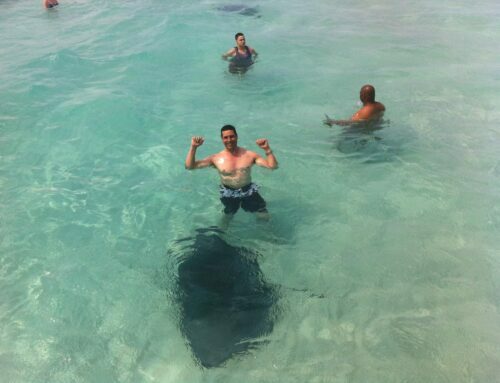 It is best to go to Exuma on your own and book half-day to full-day tours. Unless you book a private charter, which runs just under $1000 for a half-day, in order to go feed the swimming pigs you will need to book at least a half day tour that includes other stops as well. 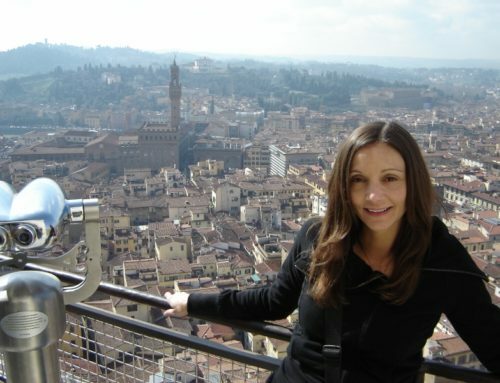 There are quite a few choices of companies to choose from with the tours varying with each. 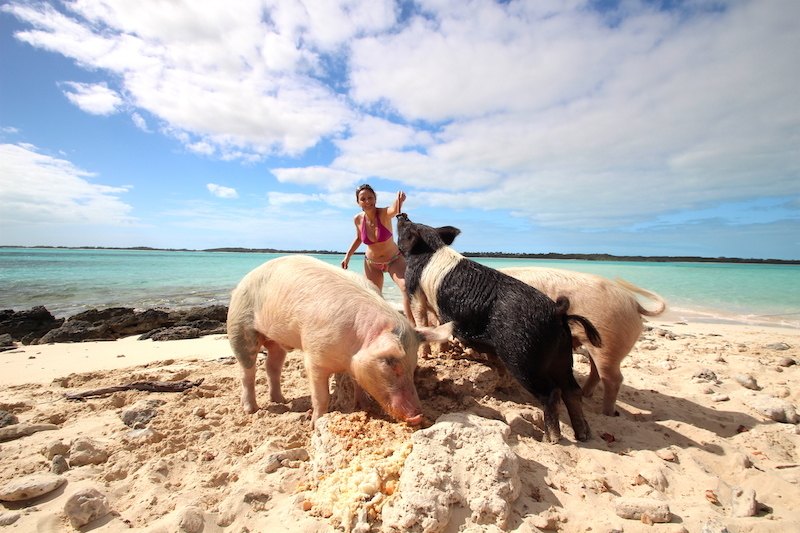 I did the Ocean Safari tour with Exuma Water Sports, where we got to feed the swimming pigs at White Bay Cay, stop at iguana island, the blowhole and a couple other beachy cays. 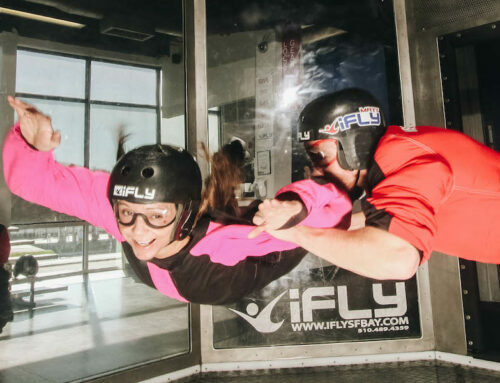 Four C’s Adventures and Coastline Adventures offer full day tours that will take you to Major Cay, Thunderball Grotto, swimming with nurse sharks and more. If you plan on exploring the Great Exuma Island it is smart to rent a car, because the cost of taxis will add up quickly and are not plentiful (though hotels can call you one if you need to go somewhere). You won’t find any of the popular American name brand car rental companies, we rented ours online with no issues through Exuma Car Rental for roughly $75 per day and picked it up right outside the airport. You can also try Don’s Rent A Car (242-345-0112) which is right next door, but it doesn’t have a website. Be warned that they drive on the other side of the road than the United States! 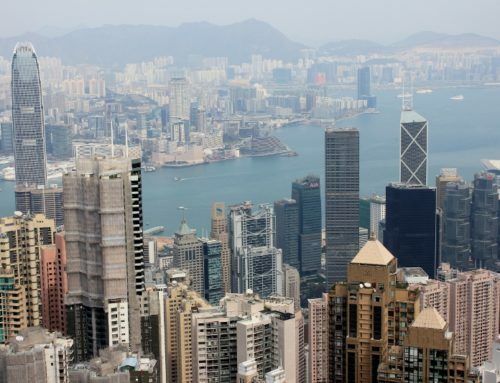 Some tour companies will do pickup/drop-off from the larger resorts. For a luxury experience, book a room at the AAA four-diamond Grand Isle Resort (from $369) where you can walk the mile-long private white sand beach and dine at their romantic Palapa Grill overlooking the pool. Peace & Plenty (from $155) is a charming hotel centrally located in the middle of the “big city” of Georgetown. Coral Gardens (from $99) is a simple B&B near Hooper’s Bay with charming innkeepers. Regatta Point (from $176) is an all suites hotel where sitting on your porch gives you exquisite views of Elizabeth Harbor, the marina or Crab Cay. It’s tough to find anything other than fish fry’s, conch and grills, so you may as well succumb. 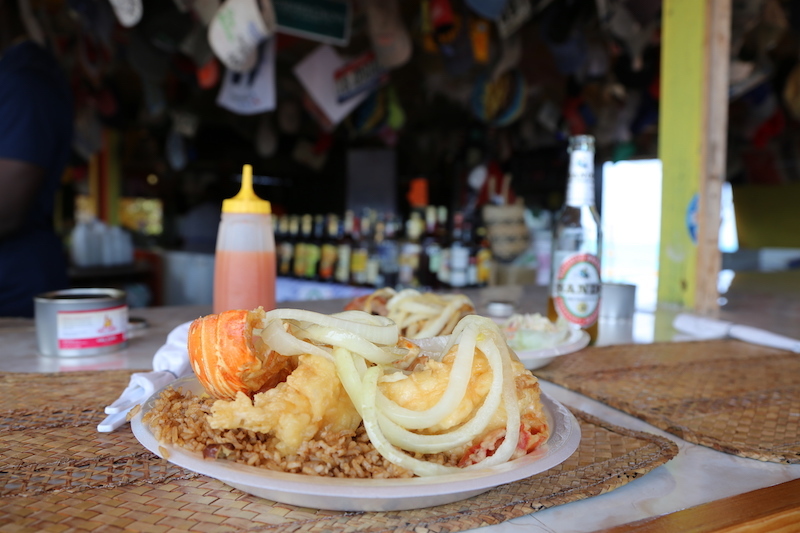 Head south to Santana’s for the cracked lobster or shrimp or eat like the locals at Shirley Fish Fry in George Town. If you want to try a traditional conch salad stop at Big D’s Conch Spot. For fancier fare, that pushes the limits of modern Bahamian eat at the Palapa Grill at the Grand Isle Resort. Spend time petting the docile Nurse Sharks at Staniel Cay. Enjoy the weekly Sunday Pig Roast at Chat ‘N’ Chill on Stocking Island. If you rent a car, be aware that Bahamians drive on the left side of the road, which can take some getting used to. Exuma is a very laid back, casual town with not a lot of excitement. Don’t expect the late night parties like on Nassau. It can get windy and chilly when you are zipping through the cays on a boat, so pack a light jacket. The sun can be deceiving in the Bahamas, bring a higher SPF sunscreen than you normally would. The Exumas are very laid back; t-shirts, shorts, sandals and sundresses are fine 99% of the time. Though you will be able to get some decent photos from the boat, a waterproof camera will allow you to take shots at their level and of their cute little feet underwater. I use a GoPro, but if you want a cheaper option just get an underwater case for your phone. A good pair of water shoes is helpful because sometimes the little piglets like to hide in the bushes of the cay. A dual-purpose Keen style active shoe would work well. A waterproof dry bag or a tote bag is not only helpful at the beaches, but also on the boat. What a wild thing to see! Swimming pigs definitely make for an unusual type of attraction. 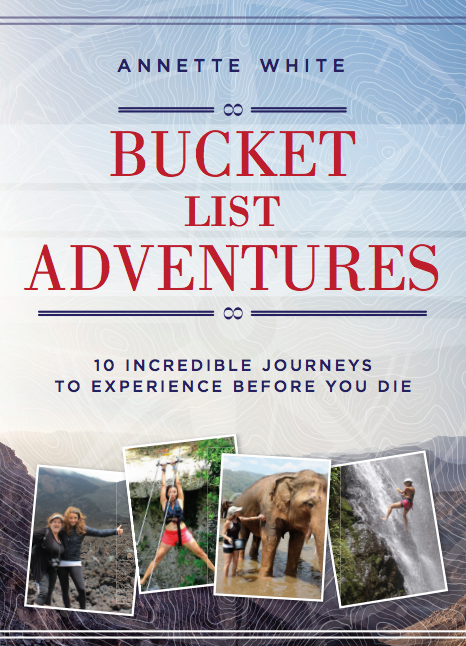 Gonna put this on my bucket list, too! It was definitely not something you see everyday! Very quirky and adorable at the same time. Great pictures and just som funny seing those pigs swim around the water as if its their most natural environment!Definitely on my bucket list now, thanks for the inspiration! 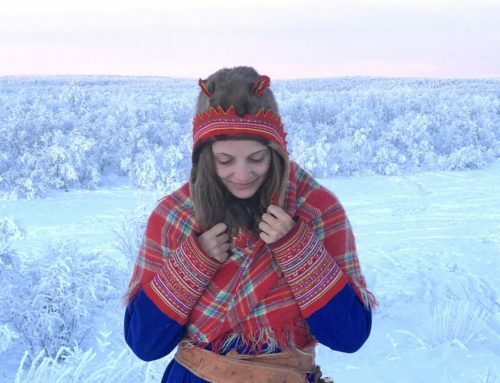 Thank you so much for such an informative blog post! My boyfriend and I are headed to George Town in two weeks, mainly to see the pigs. May I ask, did you pre-book your tour before you arrived or did you organize this once you were in George Town? I’m concerned about getting there and not being able to see the pigs because of lack of pre-booking! I booked it when we got there through the hotel we were staying at and it wasn’t a problem at all. Though technically I did book with one company in advance, but ended up canceling when I got to Exuma because we quickly learned that my husband would have gotten seasick on that particular excursion. I would say that if your main reason for going is for the pigs it may be wise to book ahead just in case because they have been getting more and more popular. Have fun and give a little piglet a hug for me!! If people are staying in Nassau they can also book a day trip with Harbour Safaris through the Northern Exumas including stops at Allen’s Cay and Big Majors, lunch at Staniel Cay with the nurse sharks, and even remote beaches and sandbanks! Great, thanks for the additional information! Any chance of coming to the “Portland of the Caribbean”, Grand Case on St. Martin (SXM)? But swimming with pigs sounds fun!